Perth’s Swan River shoreline has been reshaped and redeveloped to evolve with the changing needs of the City since settlement. In the early 1850’s, convicts were used as labour to infill the west end of Mounts Bay Road. Between 1873 and 1885 the Esplanade Reserve was created and became a ‘front lawn’ for Perth city. The Elizabeth Quay riverfront precinct is considered to be the most significant transformation of the river in over 130 years. Our desire to connect with the river is driving construction of riverfront developments such Elizabeth Quay, offering world-class business, lifestyle and living precincts. From a survey perspective, water presents a range of unique challenges on The Towers and Ritz Carlton projects at Elizabeth Quay. Surveying is a science of accurately measuring distances and angles, however measuring over large water bodies can be tricky due to a change in atmospherics, which affects the accuracy. So, when 170 degrees of the site is surrounded by water. RM Surveys needed to innovate new cutting-edge survey techniques to achieve the best solution for sound control. The construction and engineering team at RM Surveys installed continually operating, static GNSS control stations on the top of each jump core, a revolutionary new survey method for Perth’s construction industry. Each time a core is jumped, the RM Survey’s team would process the static observations and corrections, combined with redundant terrestrial observations, to produce millimetre precise control. RM Surveys have been providing leading survey solutions on waterfront construction projects over 20 years. 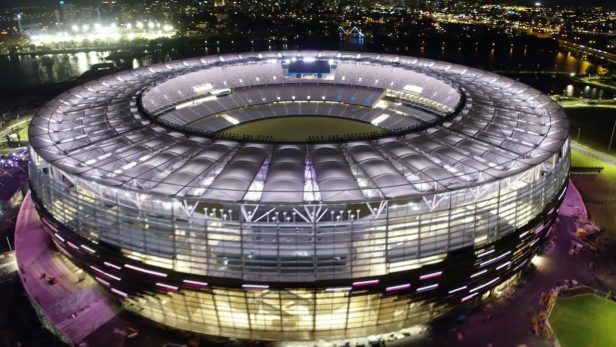 Our portfolio of projects includes Optus Stadium, The Swan River Pedestrian Bridge, Elizabeth Quay Pedestrian Bridge, WA Maritime Museum and the Narrows Bridge Duplication. Feel free to give us a call if you’d like to find out more about our waterfront projects.